Looking for more connection with your kids--and more fun, too? Welcome to the Bounceback Parenting League! This insightful and empowering book is more than just another parenting guide. It's a playbook filled with simple yet powerful "secret missions" for parents who want to recharge, refresh and restart in a positive new way. 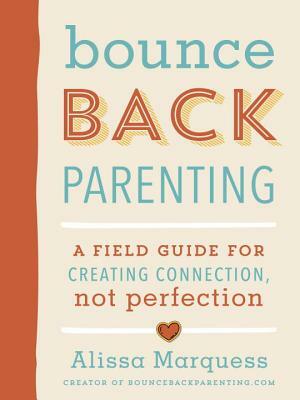 "Bounceback Parenting shows you how to foster strong bonds with your kids without having to be perfect. The “secret missions” will reduce your guilt and allow you to love more and yell less as you discover simple yet powerful ways to communicate and connect with your kids." "You don't have to be perfect to be the connected, loving parent your kids need. Bounceback Parenting's journal prompts and 'secret missions' will give you simple and actionable ways to reduce guilt, build on strengths and increase peace in your home through connection, not perfection." "Alissa begins this book reminding parents that 'everyone can learn and grow, starting right from where they are.' It really sets the tone for all parents to pick up and become stronger, no matter how confident they are today. Bounceback Parenting offers a beautiful combination of why connection (not perfection) matters and action steps to bring those ideas to life." "Bounceback Parenting is the perfect antidote for the parenting guilt that a lot of us unwittingly build up in our quest to become 'perfect' parents. Through fun operations, secret missions, assignments and field notes, Alissa helps us let go of the need for perfection and control, develop a growth mindset and resilience, and get more connected with our kids." "Human development isn’t driven by checklists guiding our perfection, but rather by the quality of our closest relationships. Bounceback Parenting is a tremendous guide for parents who are ready to focus on those critical relationships rather than the alluring lie of perfection. This book is an ideal starting point to help you ditch the overwhelm and savor the joy in parenting." "Alissa’s book is the cure to guilt in perfectionist moms! She reminds us that no one is a perfect parent and, more importantly, that perfection is not our goal. Bounceback Parenting is a guide to connecting with kids -- which is giving them what they truly need -- and bouncing back when you lose that connection. Its interactive and fun format will make it a favorite on the parenting bookshelf." "If you want to really enjoy parenting and feel more connected to your kids, this is the book for you! Bounceback Parenting offers a step-by-step guide for your journey. Soon you, too, will be shouting, ‘Connection, not Perfection!’"